Amy Stewart's young readers edition of her New York Times bestseller is at once fascinating, entertaining, informative and horrifying. One example of her amusing, accessible style: "The bed bug travels at night, lurking in low light, feeling its way toward warmth and the tantalizing odor of carbon dioxide. It approaches its dinner - in other words, you - with outstretched antennae, gripping the skin tightly with its tiny claws." The introduction is titled "Warning: We Are Seriously Outnumbered," and the book is divided by themes: deadly creatures, everyday dangers, unwelcome invaders, destructive pests, serious pains, terrible threats. 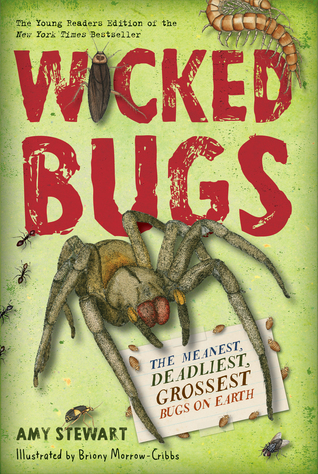 "Wicked bugs" have changed the course of history. Napoleon blamed the Russian winter for his defeat, but Stewart reports the real culprit was body lice, "a tiny, wingless, flattened insect that brought the world's mightiest army to its knees." Christopher Columbus' crewmen were so desperate to rid themselves of the Chigoe Flea, which burrows under toenails, they cut off their own toes. A fairly benign, stable grasshopper population, stressed by drought, transformed into the 1875 plague of locusts that devastated the American Great Plains. The devastation of Hurricane Katrina could be partly blamed on Formosan Subterranean Termites which devoured the sugarcane waste used in the seams of the floodwalls that were supposed to protect the city of New Orleans. Who knew that the female louse (as in head lice, the scourge of schoolchildren) is herself in danger of gluing herself in place when she excretes the cement to glue her egg in place along a strand of hair? In a chapter called "Zombies," we learn of the parasitic hairworm, which takes control of a grasshopper's brain and convinces it to take a suicide leap into the nearest body of water. The book introduces many unfamiliar and exotic insects. There is the Bombardier beetle capable of firing a hot, stinging liquid at a speed of up to 1,000 blasts per second. There is the Asian Giant Hornet, the sting of which feels like "a hot nail through my leg." (Japanese scientists have found a way to produce hornet juice to enhance athletic performance.) Meet the giant centipede, which has figured out how to hang from a cave and catch bats in midair. Meet the fire ant, hunted in Australia by helicopter using heat-sensing equipment. Stewart offers this helpful advice about how to identify a brown recluse spider: "Look deep into its eyes - they have six of them arranged in three pairs." Meet Justin Schmidt, an entomologist who was stung by more than 150 insects while developing a "sting pain index," with the bullet ant being the worst. ("Like fire-walking over flaming charcoal with a 3-inch rusty nail in your heel.") Those who already live in terror of spiders would be well-advised to steer clear. 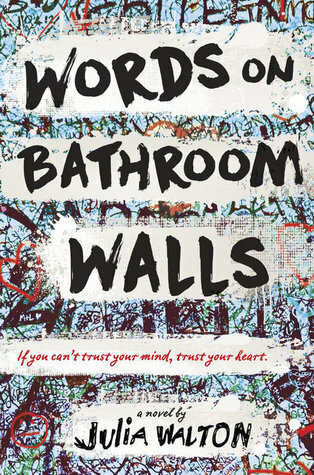 Words on Bathroom Walls by Julia Walton; Random House, 304 pages ($17.99) Ages 12 and up. This harrowing, heartbreaker of a novel offers an unflinching look at a teen struggling to live a "normal" life, to have friends, to fall in love when he is struggling with a burden most people will never understand: 16-year-old Adam Petrazelli has schizophrenia. The novel is told in Adam's voice, written as a series of diary entries addressed to his psychiatrist, since Adam refuses to talk during the sessions. ("My first doctor said it was unusual for the symptoms to manifest in someone so young…. I remember thinking: Well, sh--, that's awesome. I'm unusual.") Adam is diagnosed after an episode at school: He started screaming during chem lab after hallucinating about giant bats with human eyes and "tiny fangs that hung like needles from their mouths." Adam is enrolled in a clinical trial for a promising experimental ToZaPrex medication, and his mother and stepfather enroll him at a new school so he can start over. The kids at St. Agatha's have no idea he's "crazy," and Adam doesn't want anyone to find out, not even Maya, the smart, tough scholarship student he has fallen in love with. The new medication seems to be working, and while Adam still has hallucinations he knows the characters who keep showing up - including Rebecca, who reflects his moods - aren't real. But as the medication starts to fail, he lives in terror of losing control, that his secret will come out and Maya won't look at him the same way anymore. Walton's novel is rich in both humor and heartbreak, as Adam has to deal with his difficult illness – and the fears of even his closest family members - while trying to navigate the universal perils of high school, making friends, dealing with peer pressure and bullying.